Your weekly dose of Smash the Mic is here! Mark and Psy agree on things, disagree on others and find different things to love in this week’s line-up of new records to review which include Deftones, Moonsorrow and Ihsahn. 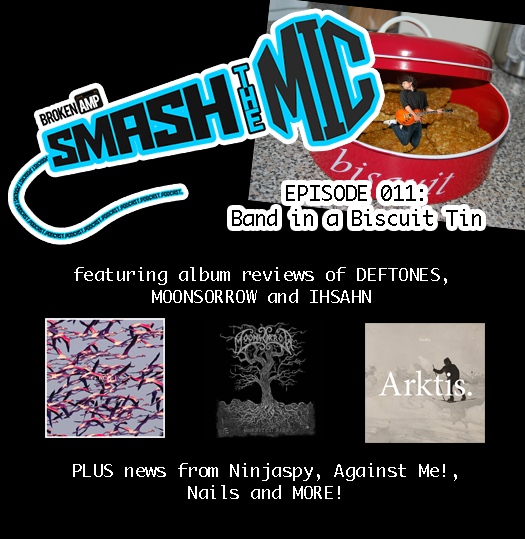 Mark also talks about a very peculiar parody band in Cage, and our news comes in the form of Ninjaspy chat, Laura Jane Grace of Against Me!‘s stance on a current controversy in North Carolina and the brand new Nails song. We close out with a lengthy discussion of our favourite guest vocal spots, and would love to hear your own suggestions! Deftones – Facebook. New album Gore out now. Website. Moonsorrow – Facebook. New album Julmaten Aika out now. Website. Ihsahn – Facebook. New album Arktis out now. Website. Cage – Facebook. Latest album Pilots out now. Bandcamp.